Dating back to the genesis of the industrial scene around 1983, these boys present a theatrical image in keeping with their weirdly unique brand of music, complete with pseudo-Germanic and pseudo-militaristic affectations. In that sense they resemble another band from that era, Laibach, known also for counterfeit German and military affectations. One major difference is that while Laibach worked from revisionist versions of cover songs, Nitzer Ebb does mainly original material consisting of harsh, repetitive, mantra-like lyrics shouted over pitiless electronic percussion and the absence of melody. The very name, Nitzer Ebb is an enigma, evoking a kind of dismal, hard feeling, but with no particular meaning, and in fact, no consistent pronunciation. 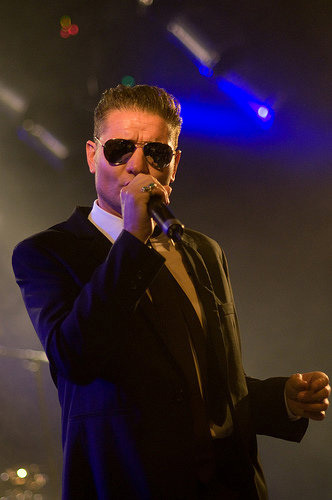 In Nitzer Ebbâ€™s heyday, frontman Douglas McCarthy used to appear in military jodhpur pants and knee-high jackboots, but this night he greeted the New York crowd warmly in shades, a suit, white shirt and tie, and in stark contrast with the punkish bandanas, mohawks and construction-booted attire of the audience. The show opened with the rapidly paced, â€œPromisesâ€ from the 1989 album â€œBelief.â€ Next, â€œLet Your Body Learnâ€ from 1987â€™s â€œThat Total Age,â€ similar in style, followed. Dancing, gyrating and strutting around frenetically on stage seems to have kept McCarthy in superb shape. â€œShameâ€ from the 2006 compilation â€œBody of Workâ€ had a funkier rhythm but increased the brutality index. â€œLightning Man,â€ too, had a sinister sound, emphasized by the hollow, deep, clangy bass-line heard on much of their music, and was livened up with a repeated jazz riff that sounded like it came from a robotic clarinet. McCarthyâ€™s jacket came off as the performance intensified with song after song featuring their ruthlessly repetitious signature sound. The crowd seemed intoxicated with McCarthyâ€™s angry, barking lyrics and the mesmerizing, motorized cadences. â€œGodheadâ€ had McCarthy growling to a rapid-fire swing beat. Nitzer Ebb certainly pleased the audience with their unique formula of maniacally repeating brutal lyrics (â€œLies, lies, lies, liesâ€¦Guns, guns, guns, guns!â€) over monotonous, thumping mechanical rhythms. Most Unusual, the Aquarian published the photo in COLOR! The bizarre performance-art/industrial music project called Skinny Puppy, now in its third decade, continues to outdo itself in every measure from musical creativity to mind-boggling staging to ghastly offensiveness. The current tour, dubbed â€œIn Solvent Seeâ€ in honor of the economic crisis, touched down in the City at the Nokia, drawing crowds of the region’s most avid industrial culture freaks young and old, many in full cyber-punk regalia. The opening act was a heavy-metal soloist backed by a digital audio track going under the name Werewolf Grehv. While he proved his abundant dexterity on the electric guitar, what he mostly produced were cadenzas of structure-less noise with no discernible rhythm. 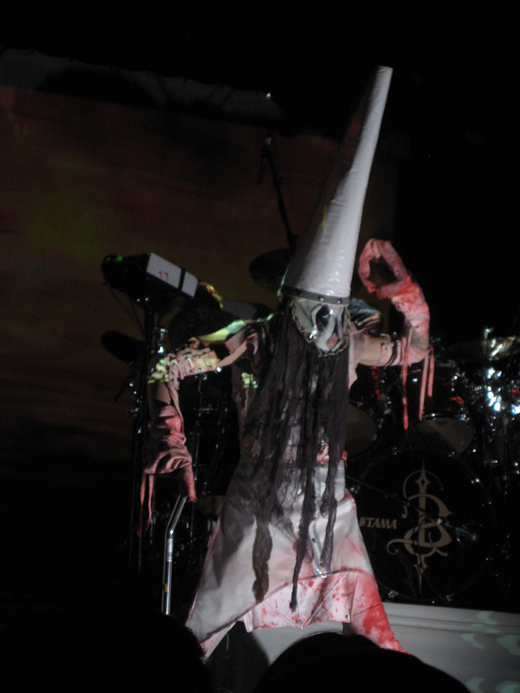 Skinny Puppy came on a little after 9:30 PM, front man Nivek Ogre horrifyingly stooped over an invalid walker, masked and in a huge dunce-cap or Ku Klux Klan hood, depending on how you saw it. If that wasn’t disorienting enough, the lighting consisted mostly of rapid-sequence motion-picture projection that flooded the stage and flickered blindingly, fragmenting the image of the stage set, the musicians and the props constantly. Musically, they were at their very best, performing many of their early masterpieces like “Addiction” and “Rodent,” but with rich electronic layers added and exceptionally clear vocals. Ogre’s costume came off in a series of unveilings, each time revealing yet another creepy mask or garment underneath. Less common classics were represented such as “Morpheus Laughing” and â€œAntagonism,â€ rather than the expected “Testure” and â€œKilling Game,â€ which were conspicuously absent. Newer material from the latter two albums included the bombastic “Pedafly” and the shocking “Politikill.” “Ugli,” off the 2007 “Mythmaker” disc, proved offensive to a handful of the audience who quietly arose from their seats and exited the auditorium when religious imagery was projected on to the background screen. “Assimilate” had political overtones, highlighted by images of the stars and stripes on screen, suggesting a critique of attitudes surrounding immigration. They took a short break around an hour into their show, returning with their greatest anthem, “Worlock” done in extended version, followed by an unfamiliar piece that featured the monotonous mantra of the word “crazy” repeated again and again. A surprising and satisfying climax was reached with the archetypal “Far Too Frail,” following which Ogre shouted the group’s appreciation to the New York crowd. Skinny Puppy has gone through break-ups, betrayals, collaborations with other musicians and the destructive withdrawal of key members, even by death. With this, their zillionth live performance in 27 years, Skinny Puppy‘s Ogre and cEvin Key have distinguished themselves as the most bold, inventive masters of the industrial style and creators of a unique brand of music that creates beautiful music out of ugly noise. Note: I have no idea how I got this excellent photo. If you read the third paragraph (above) you get an idea of how distorted and discombobulated the visual effects were. I took dozens of useless mishmosh photos of unrecognizable light and color patterns that prevailed throughout the show. Yet in one precious instant, everything was clear (see picture) and the photo at the top of this entry is the result!